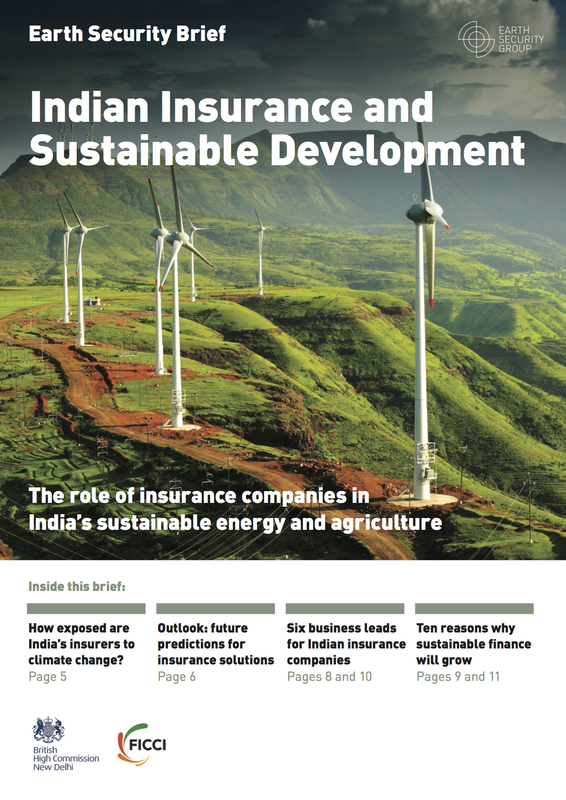 A new strategy brief by Earth Security Group launched today in Mumbai, India, discusses the risk exposure to climate change and business innovation opportunities that Indian insurance companies (and global insurers/reinsurers seeking to enter the Indian market) can pursue in collaboration with energy and agriculture companies to grow their markets in the direction of sustainable development. Hosted by the General Insurance Council of India (GIC) and in partnership with the Federation of Indian Chambers of Commerce and Industries (FICCI), the meeting included key companies such as Tata Power, Adani Power, Future Generali India Insurance, HDFC Ergo, Munich Re, Lloyd’s of London India, L&T General Insurance Co Ltd, the Insurance Institute of India, Yes Bank, and Syngenta. The ESG strategy project was commissioned and funded by the British High Commission in Delhi. Next steps in fostering greater collaboration between insurers, industry and the Indian government are being planned in consultation with leading Indian companies.